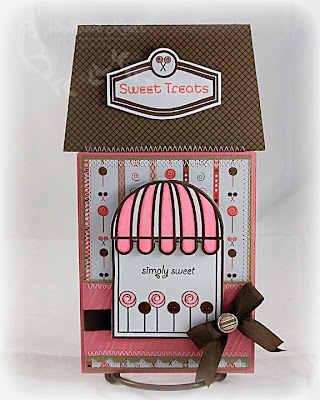 Post 1/2: If you are looking for my Sparkle Creations Sneak Peek Day 1 post, please scroll up! Hello! Have you checked out all of the My Time Made Easy © September releases? For the past week and a half, the team has been showing off some wonderful projects to give you some creative inspiration. Today, our entire team is showing our final release projects! My final project is a card that I made using the Homemade Card and Envelope cut file. 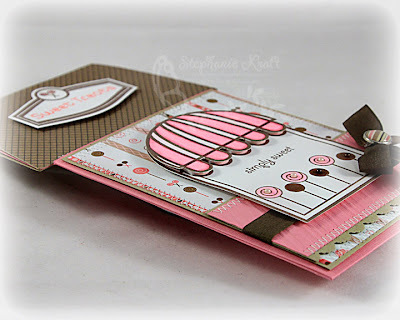 To decorate my envelope, I used Shoppe Window to stamp and cut out the window. I stamped a second awning, colored it with Copic markers and popped it on top of the window for some added dimension. I also added some embossing on the Brandenburg (pink) layer with my Candy Cane Stripes embossing folder. I added lollipops to the window (from On Display 1), colored them and added tiny pearls to the centers. Please be sure to visit the rest of the MTME team today as they are also showing off their final creations for September... you definitely won't want to miss any of it! Accessories: Labels Fourteen Nestabilities (Spellbinders), Scalloped Scallop border punch (EK Success), Candy Cane Stripes embossing folder (Provo Craft), Markers (Copic), Pearls, Brad (Basic Grey), Ribbon (May Arts), Foam tape, Thread, Sewing machine. So cute Stephanie! Reminds me of the sweet shoppe/ice-creamery in Old Town Scottsdale - Two Scoops! THis is so sweet! hee hee. Really beautiful design and the details are fun. Adorable, and YUMMY card, Stephanie! 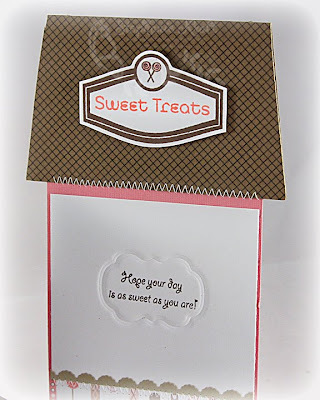 Love the bright colors, and the embossed layer on the envelope! Simply Sweet is right!! Wonderful job on MTME release Stephanie!! MY sweet treat was viewing this FABULOUS project! I just LOVE every little detail down to my FAV color combo!